Although the laundry room may not be the place where you want to spend a lot of your time, a decorated laundry room makes doing the chores much more pleasant. In fact, some of these laundry room ideas are so fantastic, you would be getting your clothes dirty on purpose just to spend more time in them! 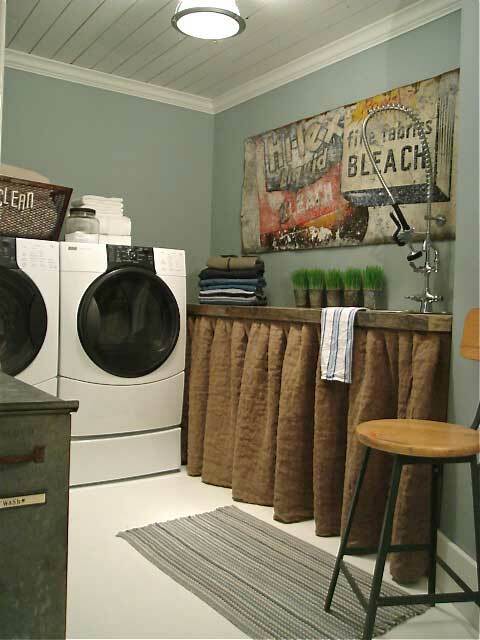 For this collection of ideas, I picked my favorite laundry room decor in a rustic chic style. The ceiling in this laundry room is to die for! 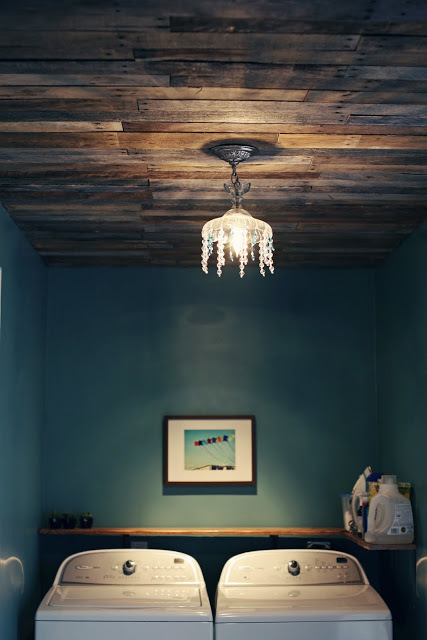 I love the chic light fixture with the contrasting wood and the wall color is so soothing. It is a space you could definitely hang out in for a long while. 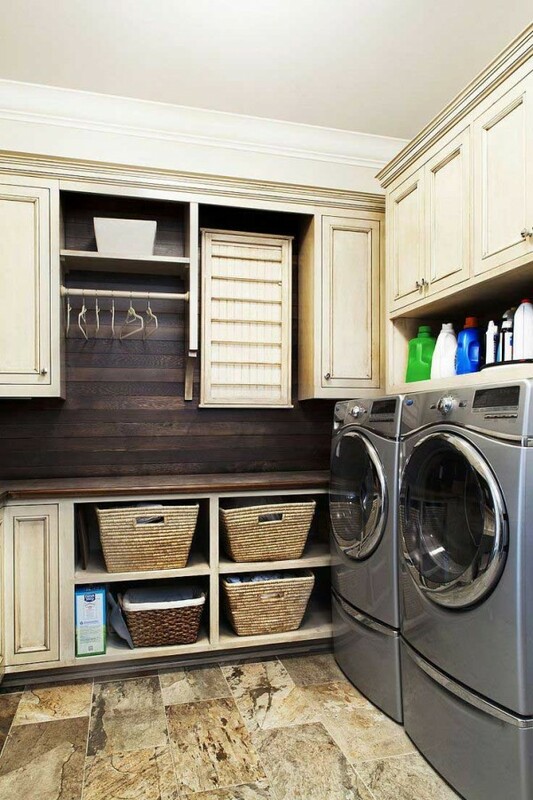 This laundry room incorporates the plank wood into the wall for a nice rustic touch. The stone tile floor also adds a warm rustic feel to the space. Light cabinets and crisp modern appliances balance the room out with some chicness. Incorporating vintage pieces into laundry room decor is a sure way to create a warm and welcoming space. 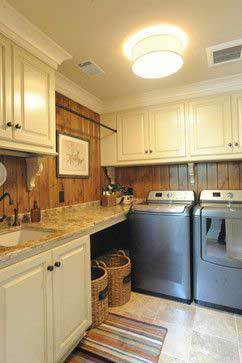 For more ideas like this, check out my post Chic Ideas For Decorating A Laundry Room. I like the monochromatic look in this room with all the galvanized metal, stainless steel and gray paint. The little pop of orange in the flower basket makes a nice statement. And here is a little more traditional design that still has some rustic appeal with the warm wood and cute baskets with the chalkboard labels. These are some great ideas. Love the wood ceiling, and would love a laundry room with lots of shelves. 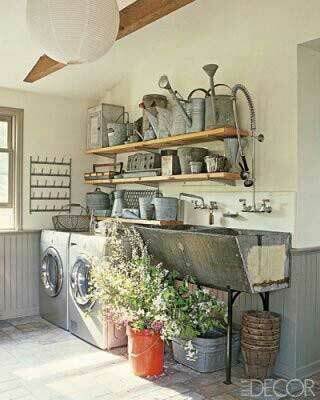 This gives me inspiration for my new laundry room in the house we are buying. Thanjs for sharing! These are really good laundry rooms. It makes washing clothes more enticing. These are far from the dark place that many people run to in order to toss their laundry into the washer or dryer. These are the type of places you invite company to and show off where you clean your clothes.